It’s been another long while since we’ve been able to post any updates! We do apologise for those of you who were wondering what we’ve been up to for the past few months. Many of Rimba’s researchers took a bit of a hiatus over the Christmas and New Year period, and the start of 2014 has been taken up with a lot of planning and preparation. Things are slowly starting to pick up now, and we’ll be sharing more updates with you over the coming months. To begin with, we’re very pleased to officially announce that one of our latest projects, Project Pteropus, is finally taking off this year. It’s had a very bumpy start trying to get off the ground (pun intended! ), but we’ve been making slow progress. Unfortunately, funding is still an issue as we haven’t had much luck bringing in adequate money to carry out the work. But, we’re still persevering, for the sake of the bats! How could we say no to such amazing critters?? Some of you may know that fruit bats, and flying foxes in particular, are Sheema‘s personal cause. These underdogs need our help because bat conservation and research isn’t something that most donors, agencies or NGOs are interested in supporting, despite the importance of bats in maintaining healthy, functioning forests. It’s been hard not to give up in the face of discouraging odds, but she’s now succeeded in making this project the focus of her PhD at MNHN. 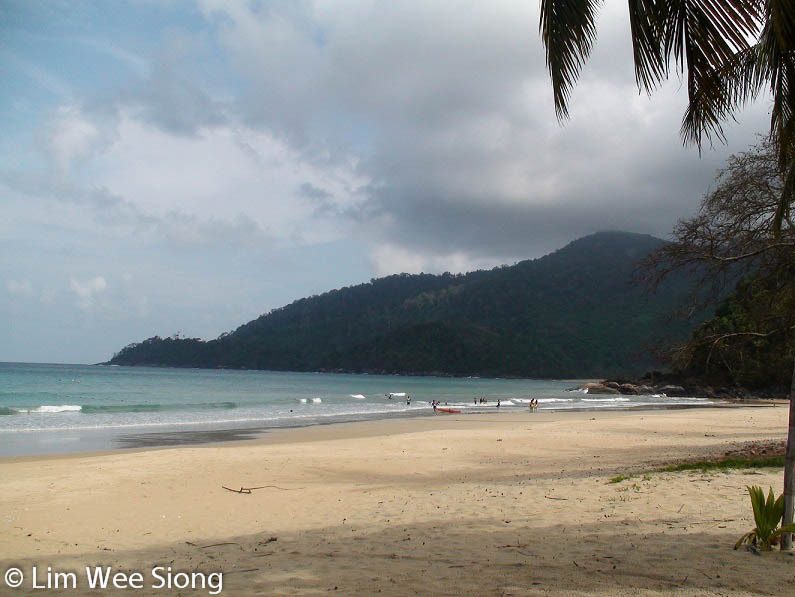 Pantai Barok, the northern part of Kg Juara, is home to the bats. Rugged and rustic, the beach is fairly deserted apart from the occasional tourist sunbathing or walking along the shoreline, or village kids (and their cats!) playing. We’re hoping to figure out what the bats feed on, which will then give us clues about what kind of role they play in the island’s forest ecosystem. To date, this has remained a complete mystery. Watching flying foxes exit their roosts in the evening to forage is a pretty awesome sight, and not one we’re likely to forget. But nobody has any idea where they fly off to, and what they do during the night before they return to their roosts at dawn. We’re really dying to find out! Based on some preliminary observations, we already know that figs form a significant portion of the bats’ diet. Also another major food plant is the ‘ketapang’ or sea almond tree, Terminalia catappa. This grows abundantly everywhere in Juara thanks to the bats’ superb seed dispersal services. 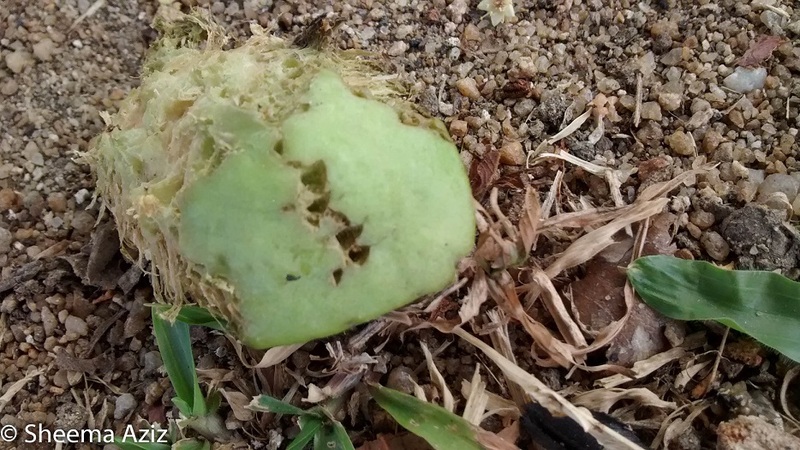 In the photo below, you can tell from the scraping and the triangular puncture marks that this ketapang fruit was definitely handled and dropped by a flying fox. However, any conservation efforts for these bats will need to incorporate a strong community element. The people of Kg. Juara are absolutely wonderful folk who have been sharing their space with flying foxes for generations – the bats have become habituated to human presence and are quite at home roosting amongst people’s houses, cafes and beach chalets. We’ve initiated a questionnaire survey to interview the kampung folk on their experiences and opinions, and based on some early results it appears that people are forced to put up with the challenges of messy droppings and noisy shrieks (the sound of flying foxes squabbling over food at dawn is the most effective alarm clock, ever!). On top of this, like other wildlife on the island the bats will zoom in on cultivated fruit such as mangoes, bananas, longans, rambutans and cikus (sapodilla). They’re also known to favour durian flowers. 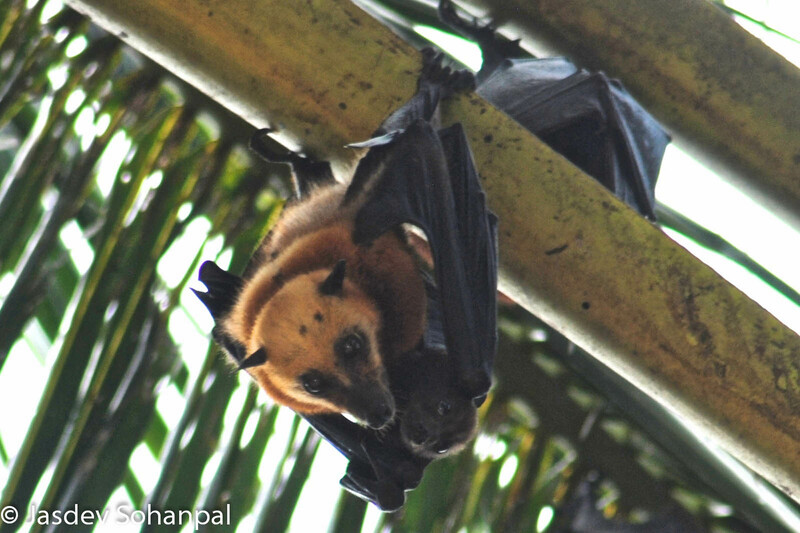 So, if we want to protect these flying foxes, it’s impossible to ignore the human dimension – we have to consider how the people are also affected, and how they feel about it. 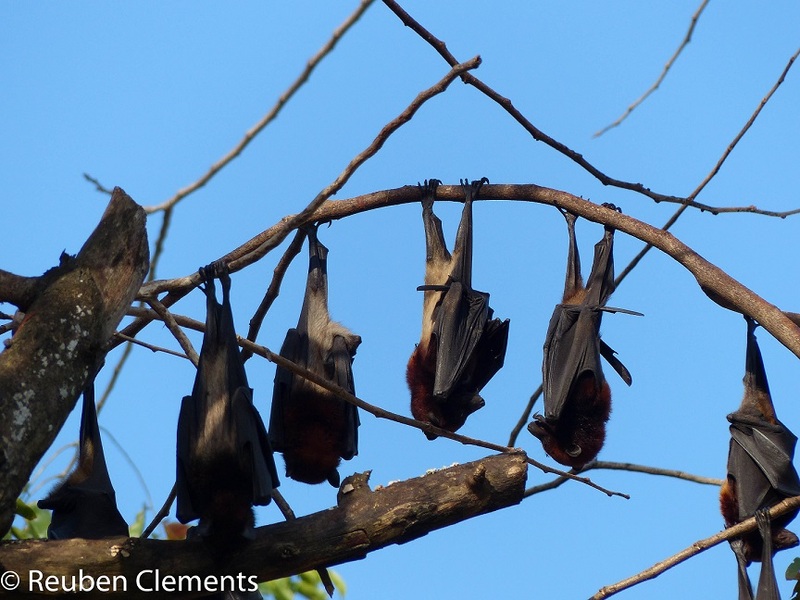 Flying foxes roosting in Kampung Tekek, Tioman.